Tip Top Readers 1-1. 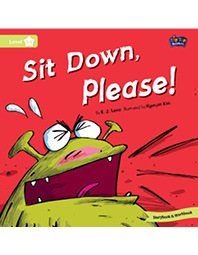 Sit Down, Please! Tip Top Readers is a 30-book series developed to help very young learners build their foundation on phonics. Carefully written stories reflect a systematic presentation of the alphabet to help readers recognize sound patterns while reading fun-filled stories with captivating illustrations. Each reader is coupled with a workbook filled with fun activities to review the story as well as phonics objectives. Each reader is coupled with a workbook filled with fun activities to review the story as well as phonics objectives. Audio is downloadable from Compass Publishing website.